We know Joseph loved Jesus. 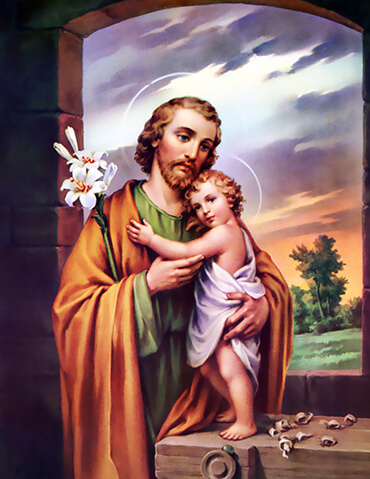 His one concern was for the safety of this child entrusted to him. Not only did he leave his home to protect Jesus, but upon his return settled in the obscure town of Nazareth out of fear for his life. When Jesus stayed in the Temple we are told Joseph (along with Mary) searched with great anxiety for three days for him (Luke 2:48). We also know that Joseph treated Jesus as his own son for over and over the people of Nazareth say of Jesus, "Is this not the son of Joseph?" (Luke 4:22). In His Footsteps: Joseph was foster father to Jesus. There are many children separated from families and parents who need foster parents. Please consider contacting your local Catholic Charities or Division of Family Services about becoming a foster parent. the most pure spouse of Mary, ever virgin, and the head of the Holy Family. You have been chosen by Christ's vicar as the heavenly patron and protector of the Church founded by Christ. Protect the Holy Father, our sovereign pontiff, and all bishops and priests united with him. and grant that all peoples of the world may follow Christ and the Church he founded. Be my father, protector, and guide in the way of salvation. Obtain for me purity of heart and a love for the spiritual life. the Immaculate Heart of Mary, and your own paternal heart.